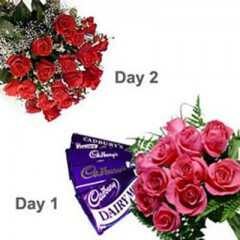 Day 1- Bunch of 12 pink roses along with 5 Cadbury chocolates. Day 2 -Bunch of 20 red roses wrapped in a cellophane and matching ribbons to your love ones to surprise them. Day 1- Bunch of 12 pink roses along with 5 Cadbury chocolates. Day 2 -Bunch of 20 red roses wrapped in a cellophane and matching ribbons to your love ones to surprise them.